Wake Forest travels to Duke on October 22 in a tough in-state battle. 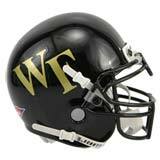 The Blue Devils and Demon Deacons played a shootout last September in Winston-Salem. Sean Renfree and the Duke offense piled on 48 points, but fell to Wake Forest 55-48 on a rainy Saturday afternoon. Wake Forest has had the Blue Devils’ number in recent years, winning the last 11 contests in the rivalry that dates back to 1889; in fact, Head Coach Jim Grobe has never lost to Duke during his tenure. The in-state rivals will clash again this fall, as the Blue Devils will play host to the Demon Deacons on October 22. BDN is fortunate to have the help of Blogger So Dear to give us an excellent inside look at the 2011 Demon Deacons. BDN: After finding themselves on top of the ACC in 2006, Wake Forest is now coming off back-to-back losing seasons in 2009 and 2010. What do the Demon Deacons need to do to return to bowl eligibility in 2011? With Wake Forest picked to finish last in the ACC Atlantic Division again, is it conceivable that Head Coach Jim Grobe could be on the hot seat? BSD: For Wake to get back to a bowl game this year we will need to make sure that we establish a solid running game and that quarterback Tanner Price stays healthy. Last season the Deacs were caught up in formation changes half way through the year on defense as we moved from a conventional 4-3 to a more exotic 3-4, which provides a different look at the line of scrimmage. Since this change was made half way through the year, and implemented for the first time at the Maryland game (a 5+ touchdown loss), Wake had some struggles on the defensive side of the ball that were hopefully a one season issue. Numbers-wise for Wake to make a bowl our best chances come by beating Syracuse, N.C. State, Gardner-Webb, Maryland, Duke, and Vandy. Of those games, only the Syracuse and Duke games are on the road. It will be difficult to get to six wins simply because of the strength of our schedule. Aside from Gardner-Webb our three OOC games are Vanderbilt, Syracuse, and Notre Dame. We also are unfortunate that we have Virginia Tech and Florida State at home in back to back weeks which are almost assuredly losses as strong as those teams look this year. If those teams were both on the road or even one of them were on the road perhaps we would have an easier game to get a W in from the confines of BB&T Field. I don’t really think Grobe would be on the hot seat after this year unless we see the same type season as we did last year. While 3-9 is not desirable it’s realistic that Wake Forest is going to have years which are akin to last year. The major criticism that came from the fan base was the way in which we were completely non-competitive in a majority of games. After the Duke game and a 2-0 start, we lost 9 games in a row, most of which were by double digits. If we go something like 1-11 and only beat Gardner-Webb I certainly think his seat would be at least luke warm. BDN: The Blue Devils and Demon Deacons both finished at the bottom of the ACC in defense in 2010, and the teams’ defensive struggles were exemplified in their September 11th 55-48 shootout. Duke is hopeful that a group of young redshirt-freshmen will improve their defensive depth and effectiveness in 2011. With 9 starters returning, what improvements are expected for the Wake Forest defense? What questions remain heading into training camp? BSD: Like I alluded to earlier, Wake struggled last year on the defensive side of the ball because of the jump we made to the 3-4 halfway through the season. So far this season the defense has looked better in preseason practices, and has really made some strides to get to a competitive level. The 3-4 provides a completely different look up front than the 4-3, an advantage against teams from the get go. A large number of teams in college run the 4-3 look and offenses are used to lining up against it. The 3-4 provides an additional linebacker to the front level and really varies the different ways the blitz can be brought. From the offense’s perspective it can be daunting as there are always seven guys in the box and you never know which side the blitz is coming from or how many guys are coming in on the rush. I’m not expecting Wake to shut everyone out, but I wouldn’t expect Wake and Duke to have a 55-48 shootout when we meet this year in Durham either. BDN: While the two programs had similar struggles defensively in 2010, Duke and Wake Forest were mirror images of each other on offense. While the Blue Devils were able to move the ball through the air, the Demon Deacons stuck to the ground, led by Josh Harris and Tanner Price. What are the expectations for Harris and Price in their second season of ACC football? What are the keys for the offense to be more consistent in 2011? BSD: Yeah, both the Deacons and the Devils were able to have at least some consistency on the offensive side of the ball. The biggest question for Wake this year is going to be just that: how consistently will we be able to move the ball downfield? Price and Harris are both sophomores. Harris has the additional experience of a redshirt year, but Price came onto campus late last July and was the starter a month and a half later. Experience is always going to be an issue for quarterbacks where studying tape and just playing the game counts for so much. The key for Wake though aside from these guys is going to have to be the offensive line. While it’s anchored by an experienced group it has really struggled to open up holes for the running game and to adequately protect Tanner. If Price has time to drop back, set his feet, and throw he is deadly accurate, but he simply didn’t have that opportunity much last year. The receiving corps is set up well with senior Danny Dembry as the most likely go to target as a possession guy, junior Chris Givens and sophomore Michael Campanaro as the flankers, and then freshmen Matt James and Brandon Terry as compliments to Dembry as bigger, possession-type receivers. If the line can get some leverage up front, our offense has the potential to be a real threat this year. BDN: At this year’s ACC Football Kickoff, OG Joe Looney declared the Blue Devils as the Demon Deacons’ biggest rival. From the Duke perspective, the Blue Devils need to start beating their in-state ACC rivals to take the next step forward as a program. Can you describe this rivalry from Wake Forest’s perspective? With all of their recent success against the Blue devils, why do you think the Wake Forest fans and players consider Duke to be their top rival over other ACC programs? BSD: Since Grobe got to Wake, we have had a ton of success against in-state opponents and it really was one of the keys to Wake’s bowl run a couple of years ago. When I was growing up my view of the Wake-Duke game was that it was a futility battle. No offense to either programs, but I remember a handful of games where the teams combined didn’t have more than 2 or 3 wins so it was always a question mark as to what would happen. The 2006 game with you guys is generally viewed as the most pivotal moment of the season. Had Vaughn not blocked that field goal as time expired to preserve Wake’s 14-13 win, we certainly would not have gone to the Orange Bowl or won the ACC that year. To be blunt though, it is a game that right now I always expect to win. Obviously the 11 game winning streak (dating back throughout Grobe’s entire tenure) will have to end sometime and this year is just as likely as any of them. Wake typically handles Duke fairly well at Wallace Wade though, and a struggle at BB&T. Looney probably considers Duke to be Wake’s biggest rival from a recruiting vantage point, as well as the fact that we have had so much recent success. Both Wake and Duke are battling the same problems in football: small school, lack of a football history, and being in a state where UNC, NC State, and App State, are the first schools thought of when football fans think of North Carolina. For Wake or Duke to be successful on the ACC level I believe they must be successful within the state first and foremost since at least two of the eight conference games every year are against a team from North Carolina. BDN: The Blue Devils and Demon Deacons are one of the oldest rivalries within the ACC, with the two programs having first met in 1889, with Duke holding a 53-36-2 all-time record, despite Wake Forest’s current 11-game winning streak in the series. In the last few years, it seems that every game between the two schools has come down to the final possession. What do you expect to see from this year’s matchup on October 22nd in Durham? BSD: I always love watching Wake play Duke, as I said anything can happen and the games are typically exciting (if not nerve-wracking). While it’s pretty early to make a prediction, I honestly believe that Wake will win this one and stretch the winning streak to 12. I’ll certainly be there on October 22nd to watch the game as it’s just a short drive down 40 and tickets are easy to come by. I think that it will probably be another high scoring game as it always is when the teams meet, and that it will probably once again come down to the final possession. Wake needs to force some turnovers, run some zone blitzes to keep Renfree from being able to set his feet and throw deep, and establish a running game to get the victory. I’ll make my way-too-early guess though: 38-34 Wake on a late touchdown run by Harris. BDN: Thanks so much for answering our questions. Good luck this season!